Today it’s not about who you are online, but rather how people can relate to you and/or your personal brand. In order to create new leads for your business it is important to recognize that getting on the same level of your audience is a process of building trust. How can your personal brand connect with fans and followers in an authentic way? Through creating a brand story that will make them want to spread the word and make a purchase from your company. A simple tweet or post of content is not enough to hold people’s attention any more, and with a little effort and research you can reach out to your community and create loyal brand ambassadors. Social media marketing is all about meeting the needs of others, and presenting a message that is relatable and compelling. There are several ways to attract followers to your personal brand with a powerful story. • Catch their attention right away – Most people will click away from an article without even reading it first if it doesn’t capture their attention right away. A video that is both interesting and entertaining will help your story to stand out and be viewed. This needs to be done in a way that conveys what your personal brand is about, and can showcase things like a story behind a service, product, or even an event that your company has learned from. • Show what you have to offer – Much like a film or screenplay your brand can draw in an audience with a dramatic introduction or setup that includes an answer to the problem at the end. Relatable characters will also help create an emotional connection for your viewers. • Include an interest to want more information – Leave your brand’s story open for a continuation or conversation on social media. This is a good opportunity to provide special offers, and grow your networks. It’s important not to actually sell anything to them at this point, as that can be nurtured after people show interest. 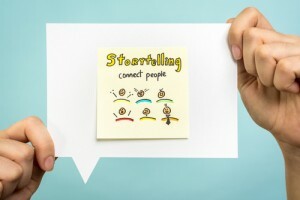 Storytelling for your personal brand is a great way to connect more with your leads and customers. Entice your market with creative stories that have verified facts and information, and that strongly represent your company’s message.